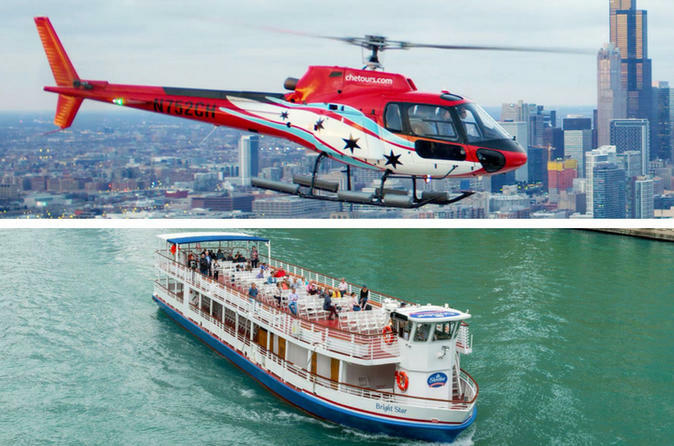 Explore Chicago by air and water! See landmark buildings and architectural favorites up close as you cruise down the Chicago River. Then, take off aboard a state-of-the art helicopter for breathtaking views of the skyline and lakefront. You’ll see Wrigley Building, Marina City, Willis Tower and much more. Your epic journey begins aboard a picturesque cruise, led by a professional guide that gives exciting details of the buildings that line the Chicago River as well as their historical significance. You’ll sail down all three branches of the Chicago River on this 75-minute tour featuring Willis Tower, Marina City, Wrigley Building other iconic landmarks. Your guide will dive into the dramatic story of how Chicago rose from the ashes of the Great Fire of 1871 and share insights on the architects that made Chicago legendary. This once-in-a-lifetime experience is fun for the entire family! Special Offer - Price displayed includes a 20% savings off the local admission price! - Book Now!